And pass from hence away. Nor the Battle to the Strong. It cracks me up to see such a beautiful, elaborate stone with a line gouged out so inexpertly. What did that line say? Who chipped it out? I find it hard to imagine that a carver who applies such a light hand to "AD" would have sent a stone out of his shop with a line half-erased so roughly. It doesn't look like it said "departed" — I wonder if it was a piece of information that the family decided that they did not want included after they saw the finished stone. I can't find anything unusual about his life and death. His will was dated a month before he died at age 45, so his death would seem to be from a long illness. At the time of his death, he was described as an innkeeper. The obliterated word might in fact be "Innkeeper" -- with the "I," "k" & "p" fitting well; those tiny marks above the line are odd, though. I suppose some of the family may have objected to having his occupation on the stone, or maybe the word was misspelled or badly executed? Jim's right, it could be "Innkeeper." Is that consistent with gravestone practices of this time and place? Did contemporaneous stones sometimes list the deceased's occupation in such a manner? Geez, I thought I would clean up the thread by consolidating two posts. So much for that plan. I have been studying the subject of occupation on 18th century headstones in Ireland and specifically in the Dublin area. Approximately 50% of male headstones bead the occupation of the deceased. It's a real insight into Georgian middle-class Dublin. I have come across some quite unusual occupations. Out of the hundreds of headstones only two women were remembered on terms of their trade, one a pastry cook and the other a baker. 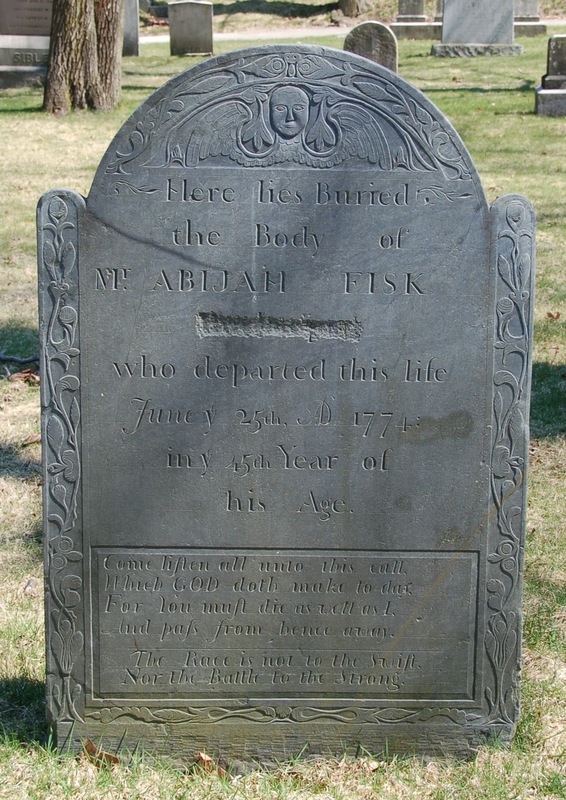 It's not particularly common for New England stones to list the deceased person's secular occupation, but it isn't rare enough that I would be surprised to see it. I think "Innkeeper" is a great guess, though I don't know why someone would scratch it out. Religious occupations and titles are routinely noted (minister, deacon, etc.) as in the case of sexton Daniel Guild (1795). One more thought: Was the "Mr." title added later? It's out of alignment with the rest of the text. Maybe Mr Fisk wasn't who he said he was. What if the scratched out was when he was his birth and it was incorrect.